Accelonix Ltd is pleased to announce participation at this year’s ElectroTestExpo, the UK's only dedicated board test, inspection, device programming and debug event for electronics professionals. For almost a decade, ElectroTestExpo has created a platform for introducing new test methods, products and services to the UK electronics industry. This annual, free-to-attend, one-day event consists of insightful seminars lead by industry experts and offers an opportunity to witness live demonstrations and experience some of the latest technologies. We are proud to announce that PARMI, a leading supplier of 3D AOI (Automated Optical Inspection) and 3D SPI (Solder Paste Inspection) technology has partnered with Accelonix to become the latest addition to our portfolio of world class PCBA Test and Manufacturing production equipment. The PARMI range of next generation 3D inspection systems are engineered to cut production times whilst delivering accurate and repeatable results. PARMI represents the perfect addition to the Accelonix portfolio of Advanced PCBA Test Equipment and offers capabilities that strongly complement our existing product offering. 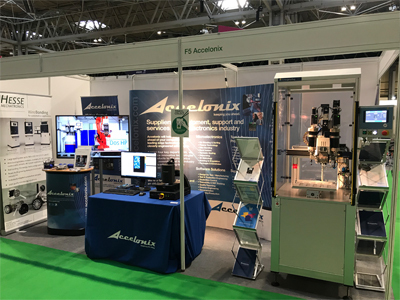 At this years’ Advanced Engineering Show, hosted by the NEC Exhibition Centre in Birmingham, Accelonix exhibited the latest advances in dispensing and potting technology from Scheugenpflug, alongside the latest 3D Non-Contact Surface Measurement systems from cyberTECHNOLOGIES. “We are extremely pleased at the level of interest shown in our product portfolio at this years’ Advanced Engineering Show. It was great to welcome so many new customers onto our booth. There is clearly a great deal of relevance to the technologies we offer and customers seemed to really appreciate our ability to support multiple aspects of their assembly process. A great example of this, is the discussion relating to EV battery assembly, linking Scheugenpflug Material Dispensing and Hesse Heavy Wire Bonding technology for the electrical interconnection process.